An online shop for folklore music (CD and DVD), Bulgarian traditional instruments and costumes, souvenirs, books and learner’s books for Bulgarian language, icons, carpets from Chiprovtsi and other articles connected to Balkan folklore. Send martenitsa to your friends! The Martenitsa (martenica)... this magical amulet inherited by our predecessors is the first sign of the coming spring. That's why each Bulgarian wears martenitsa on the first of March, symbolizing ones faith that hereon everything will be better. People will smile because they believe they have won the benevolence of Baba Marta. Grandmother Marta, traditional Bulgarian custom (Baba Marta). Photos (pictures) of martenitsa. Send martenica card to your friends or buy martenica from Balkanfolk shop. Pictures of details of Bulgarian folk costumes made in Atelier Balkanfolk. Photos of coats, shirts, jackets, towels, pinafores and other items. The Download category includes folklore songs and instrumental melodies performed by different folklore singers and musicians. In honor of 24 May – the Day of Slavonic alphabet and Bulgarian enlightenment and culture Balkanfolk donates 5 Bulgarian folklore music CDs to every Bulgarian cultural house. Atelier for manufacturing folklore costumes: production of males, women's and children's folk costumes (narodni nosii) from different ethnographic regions of Bulgaria. Dance, Play, Sing, Have Fun! Goodbye 2010 ! .... Seminar 2011 is already underway .... ! The official launch of the new edition of Balkanfolk 2011 will take place in December 2010. Feel free to return to our site for further information. 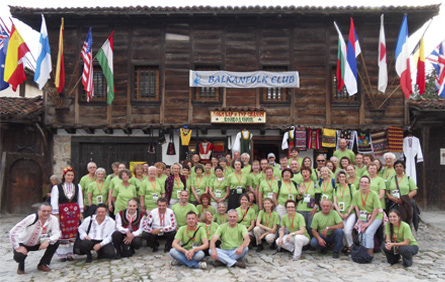 Balkanfolk 2010 seminar was an excellent and great year ! Find here some photos of Koprivshtitsa Balkanfolk 2010.